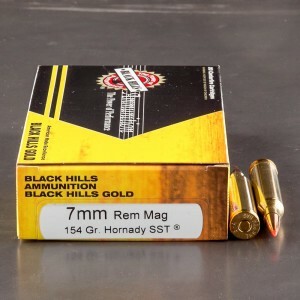 7mm Remington magnum ammo has been a mainstay among hunters for more than a generation. 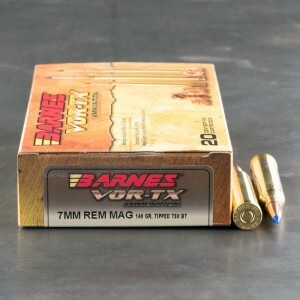 Any debate about the best all-around game cartridge will soon get heated because there will likely be a group of 7mm Rem mag devotees present and vocal! And rightly so! Since its introduction by Remington in 1962, this new hot magnum has continued to gain a loyal following. See for yourself; if you regularly shoot the popular 7mm cartridge, it will quickly become apparent that whatever the .30-06 or .270 can do, the 7mm magnum can do it just a bit better! This super Remington cartridge has factory ammunition available in a myriad of bullet weights and styles. The gun can be used on varmints to bears and everything in between with excellent results. It is even a popular African plains gun. With factory ammo primed with the incredible premium bullets now available, the 7mm magnum loses nothing to other comparable rifles in ballistic performance - both in-flight as well as terminal ballistics. T Rex of bullets. devastating.